Right now, my youngest child is going on 20 months old. He really is not a picky eater...except for when it comes to vegetables. The other night I served up a really yummy dinner with mixed vegetables and of course (like a good mom...ha ha) I had to offer him some even though I knew he would not eat them. As I suspected he did try them but spit each and every veggie out. I didn't know this until I took his bib off and saw the half-chewed veggies in the pocket of the bib. Rats. But, I tried! If you were to offer him any other type of food, he probably would have eaten it but for some reason he just doesn't care for the vegetables. I am not sure why he despises them now...I always gave him veggies when he was a baby and he ate them with no problem at all!! Hmm...must be the fussy stage setting in now. When we started Peter Rabbit Organics we made 3 promises: that everything we make would always be 100% organic, 100% healthy (no added sugar, no added salt and nothing artificial) and always taste 100% delicious. I love how this company really does offer organic foods for all ages! It really puts my mind at ease when I know my children are not getting all the additives, chemicals and preservatives that are found in most "fun foods" for them. Ok mom...so what is this stuff? First taste...he is thinking about whether or not he likes it. BINGO!! See the smile??? He ate the whole pouch! :) YAY! Not only did he eat the entire pouch of Strawberry and Banana, he wanted more so I gave him the Spinach, Peas and Apple pouch next. Guess what?!? He ate that too...ALL of it! :) This momma was thrilled! I just wish I had more to give him. Then, when my three year old saw him eating something yummy, of course she wanted to try some too! So, I gave her the Mango, Banana and Orange to try. She ate almost all of it and we stuck the rest in the fridge for another day. She liked it very much...and here is her smile to prove it! 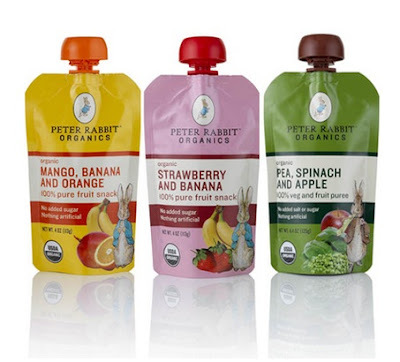 So, if my children loved these pouches from Peter Rabbit Organics, I just KNOW yours will love them too!!! You can find Peter Rabbit Organics at a multitude of retailers...specifically natural food stores and online retailers as well. Check out the "where to buy" tab on their website to find a location near you. Each pouch retails for about $1.50 or you can buy a larger quantity if you wish. So, in my opinion...Peter Rabbit Organics is a wonderful company! If you have a picky eater, no matter what their age, you will be sure to find a yummy and healthy snack option among Peter Rabbit Organic's fruit and veggies pouches. I was thrilled that my children enjoyed them and am definitely going to think about getting more for them. Disclaimer: I received no monetary compensation for this post. I did receive free Peter Rabbit Organic Food Pouches for review purposes. All quotes and stock photos are from the Peter Rabbit Organics website and email. Prize is being shipped by the sponsor. All thoughts and opinions are 100% mine. My daughter would love apple & grape! My son loves all the flavors, and since he is a picky eater we love giving them to him to pack him full of veggies and fruit! The Peach and Apple sounds really good! My son does not eat any veggies or fruit, so I buy his "Peter Rabbits" at Starbucks and he has his fruit in his lunch box everyday!! He loves the mango!! Strawberry is not available but we have tried it and he loves that too!! We'd like to try the pea, spinach and apple...the combination sounds interesting! Thanks! :) Stacy N.
Peach and Apple is what my daughter would love! I like the Pea, Spinach and Apple flavor - great way to get them to eat their peas! im excited about the pea spinach and apple! hopefully the baby will be too! pea spinach apple. trying to get more veggies in him! My 2 sons would love the strawberry and banana! Mango, banana, and orange looks like it would be a winner! Strawberry and Banana, its a classic. Strawberry and banana for my kids! I think my four year old would love the mango, banana, orange. My one year old would like the pumpkin apple. my daughter would like the strawberry/banana flavor. The pear and apple blend sounds like something my daughter would like. My son would love the Peach and Apple flavor! I think strawberry and banana could possibly be a winner! My son would like all of them, but I'd like Peach & Apple the best! Sweet Potato Corn and Apple! My kids would love strawberry banana. My son would love the Strawberry and Banana. I think the peach and apple would be our favorite.